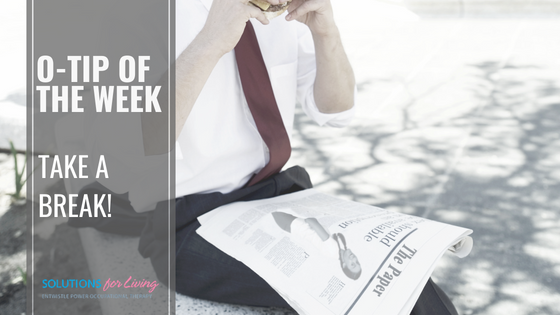 Our O-Tip of the week series we will be providing valuable “OT-Approved Life Hacks” to provide you with simple and helpful solutions for living. For the month of February, our O-Tip of the week series will talk about Self-Esteem, which is defined as confidence or belief in one’s own worth or abilities. Self-esteem issues affect more than just teenagers and encompass more than physical insecurities. Follow along this February to learn more about self-esteem, its importance and some simple ways give your self a boost! One way you can harm your self-esteem is through constant comparison of yourself to others. However, putting a stop to this is, in fact, a difficult ask – magazines, tv shows, movies, social media… all of these things serve as channels to fill your mind with false images of how you “should be.” Check out this great article care of Psychology Today which provides some great ways to get you to stop comparing yourself to others and see the amazingness within! As a student working with an Occupational Therapist in the community, I realized early in my placement that many clients struggle with anxiety and depression in combination with cognitive challenges like decreased attention, concentration and focus, difficulties with memory, and slower information processing abilities. This spiked my interest, as I was unaware of the possible impact anxiety and depression could have on cognition and how these symptoms could be related. I decided to look into this further, and am sharing my findings below. Occupational Therapists work in a wide variety of settings including the community. As the hospitals become less and less able to accommodate people long-term, community-based occupational therapy services are becoming more and more common. Working in the community allows occupational therapists to reach a wide variety of clients, and therapists utilize a strength-based approach to build on the client’s current strengths to promote wellness and productivity. Depression and anxiety are the most common types of mental illness throughout the world, including Canada. From my community placement experience as a student Occupational Therapist, I have found that the majority of the clients I have seen are experiencing depression and/or anxiety, often in combination with other primary diagnoses. Interestingly, depression and anxiety can negatively impact the way the brain thinks, learns, and processes information and thus how it functions. 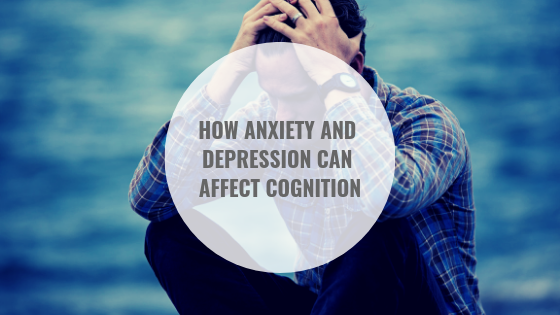 However, the relationship is complicated as a decrease in cognition may also lead to an increase in depression and/or anxiety which can then perpetuate the cycle. The result for most people tends to be poor functional outcomes in their daily lives. Additionally, the brain regions believed to be responsible for these functions have been shown to be abnormal in people that also suffer from anxiety and depression (e.g. hippocampus, amygdala, temporal lobes, and prefrontal cortex). Decreased memory, slowed information processing, and issues with verbal communication can negatively impact multiple areas of people’s lives. 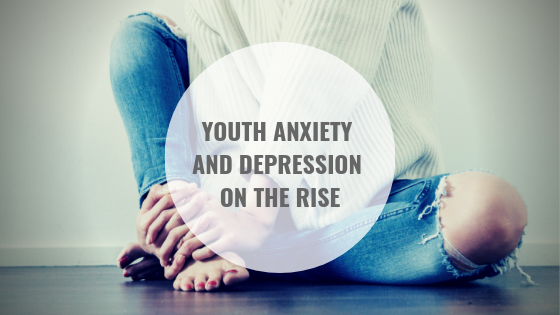 This information demonstrates the importance of the need to detect and treat anxiety and depression as early as possible as well as the need for early cognitive interventions for clients with anxiety and depression. As a student Occupational Therapist, I wanted to further investigate how Occupational Therapists can help. I found evidence that Occupational Therapists can help clients in reducing functional decline, while also reducing the probability of relapse by treating cognitive deficits. Occupational Therapist’s target these areas by teaching client’s cognitive remediation and compensation strategies during their interventions and treatment monitoring. With both, often, a cognitive behavioural approach is taken. Cognitive behavioural therapy (CBT) works to change clients thought structure to allow positive mood change, enhance coping strategies/problem solving, and help challenge faulty beliefs. Anxiety and depression are common and are known to negatively impact a person’s cognition. Worsening cognition then can deteriorate anxiety and depression further. Early intervention is key to break this cycle and to promote function and wellness. Occupational therapists play a vital role in providing interventions for those with anxiety and/or depression by implementing interventions for these issues, as well as treating the common resulting cognitive deficits. Both remediation and compensatory techniques are used, often through cognitive behavioral therapy. If you, or someone you know, is struggling with anxiety or depression this may present as cognitive difficulty, or if cognitive issues are present, anxiety and depression may also surface. Consider occupational therapy if you would like support and strategies to improve these symptoms and to reduce their effect on your daily life. 1. Carrier, A., & Raymond, M. H. Community occupational therapy practice in Canada: A diverse and evolving practice. 2. McRae, L., O’Donnell, S., Loukine, L., Rancourt, N., & Pelletier, C. (2016). Report summary-Mood and Anxiety Disorders in Canada, 2016. Health promotion and chronic disease prevention in Canada: research, policy and practice, 36(12), 314. 4. Lee, R. S., Hermens, D. F., Porter, M. A., & Redoblado-Hodge, M. A. (2012). A meta-analysis of cognitive deficits in first-episode major depressive disorder. Journal of affective disorders, 140(2), 113-124. 5. Jaeger, J., Berns, S., Uzelac, S., & Davis-Conway, S. (2006). Neurocognitive deficits and disability in major depressive disorder. Psychiatry research, 145(1), 39-48. 6. Bora, E., Fornito, A., Pantelis, C., & Yücel, M. (2012). Gray matter abnormalities in major depressive disorder: a meta-analysis of voxel based morphometry studies. Journal of affective disorders, 138(1), 9-18. 7. Femenía, T., Gómez-Galán, M., Lindskog, M., & Magara, S. (2012). Dysfunctional hippocampal activity affects emotion and cognition in mood disorders. Brain research, 1476, 58-70. 8. Lorenzetti, V., Allen, N. B., Fornito, A., & Yücel, M. (2009). Structural brain abnormalities in major depressive disorder: a selective review of recent MRI studies. Journal of affective disorders, 117(1), 1-17. 9. Fleming, J. (2017). An occupational approach to cognitive rehabilitation. Workshop presented through the Canadian Association of Occupational Therapists, Toronto, ON. 10. Grieve, J. I., & Gnanasekaran, L. (2008). Intervention for Cognitive Impairments. Grieve, JI, & Gnanasekaran, L.(3rd ed. ed.). Neuropsychology for occupational therapists: cognition in occupational performance. Oxford. Malden, Mass. : Blackwell. 11. Haran, D. (2009). Cognitive-behavioral therapy for depression. The Israel journal of psychiatry and related sciences, 46, 269. 12. Knapp, P., & Beck, A. T. (2008). Cognitive therapy: foundations, conceptual models, applications and research. Revista Brasileira de Psiquiatria, 30, s54-s64. The Centre for Addiction and Mental Health (CAMH) has released the results of the latest Ontario Student Drug Use and Health Survey and the results are showing rising instances of anxiety and depression in grades 7-12 students. Learn more about the results and how gender may play a role in the following care of CAMH. Our O-Tip of the week series delivers valuable “OT-Approved Life Hacks” to provide you with simple and helpful solutions for living. For the month of Movember, a month dedicated to Men’s Health, our “MO”-Tip series will provide you with OT-approved ways to take care of the men in your life. These behaviours are untraditional of typical depressive symptoms but mean that men who may benefit from emotional aid are often slipping under the radar for health professionals, and this can lead to disastrous consequences including poor quality of life and higher rates of suicide. If you, or a man you know, is experiencing these symptoms speak to a healthcare professional. 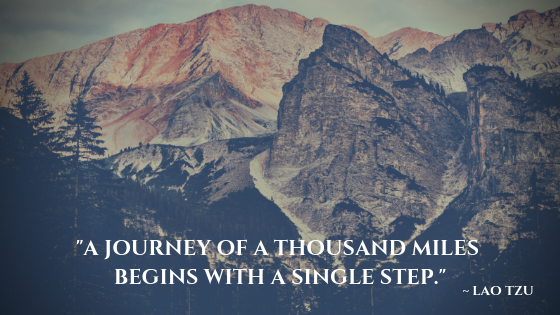 This Movember, commit to walking or running 60 km in recognition of the 60 men we lose each hour to suicide. Learn more here. 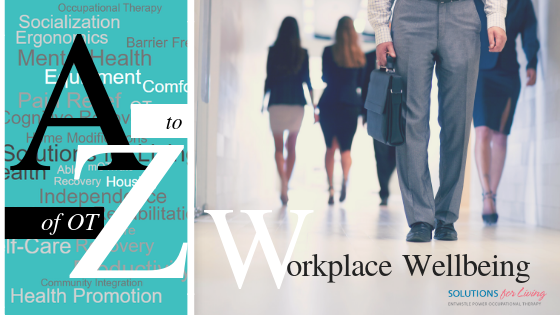 There are many ways that Occupational Therapists promote wellness and wellbeing for those in the workplace. From ergonomics to accessibility; injury prevention to return to work programs, OTs assist in the workplaces in many facets. We are going to focus on an important way that Occupational Therapists can assist employees and employers at work – by improving mental health. Learn more about how OT’s can provide essential information and assistance to enable the support of mental wellness at work in our OT-V video below, or in our post, Promoting Mental Wellness at Work. October is Occupational Therapy Month and to celebrate we will be sharing a new series called the A to Z of OT. In our attempts to further educate the public about what Occupational Therapists do we will be highlighting twenty-six of the awesome ways OTs provide Solutions for Living. We encourage you to follow along and to add to the discussion by highlighting other awesome things OTs help with for each corresponding letter! 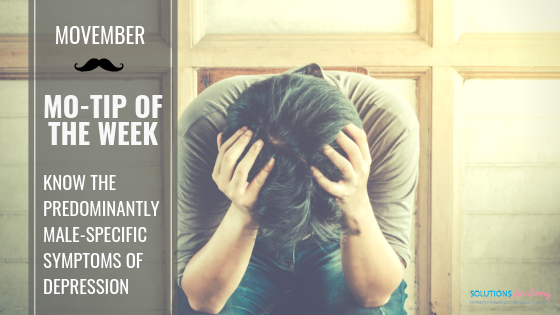 O-Tip of the Week: Take a Break! For the month of September, a month of back to school and back to reality, our O-Tip series will provide you with OT-approved ways to put the focus back on you. This week’s O-Tip can help to improve your mental health in a matter of a few minutes each day. Remember it’s important that we take frequent breaks to reduce stress, improve focus and to take care of ourselves. One in Five Youth Struggle with Mental Health Problems – Do you Know the Signs? I was recently reviewing my daughter’s school handbook and noticed the section on child and youth mental health. 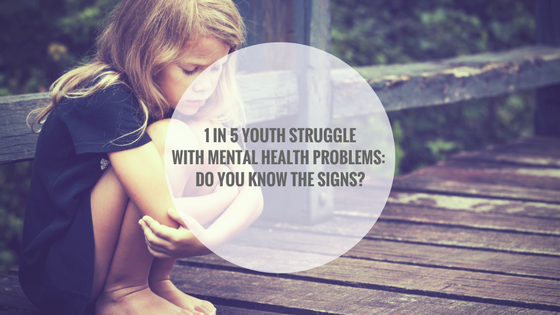 According to this (and the Canadian Mental Association) 1 in 5 children and youth struggle with mental health problems. While great strides have been made over the last several years to destigmatize and demystify mental health problems in both adults and kids, I feel this remains generally misunderstood. In my practice, I still see the common misperceptions that people with anxiety don’t leave the house or appear nervous and anxious in public, or that people with depression sleep all day, don’t attend to their appearance, and sit around crying and feeling sorry for themselves. The truth is that mental health is a spectrum, or a continuum if you will. It can vary and no one’s experience will be the same. In children, mental health problems can present differently. In general, parents should be able to monitor most of these and overt changes might be obvious (suddenly disconnecting from friends, drastic changes in grades, behavior change at home, quitting enjoyed activities, not eating food or participating in meal times, etc). But like with the continuum of mental health in adults, some of these might present some days and not others, or be so subtle that they deteriorate very slowly over time. As parents of teens we need to be the barometer for our kids as they may lack the ability to relate some of these signs to mental health or internal struggle. Luckily, in Southern Ontario anyway, I see the mental health problems of kids being taken seriously and there are publicly funded community supports available. But getting your child connected with these can be the challenge. It can be hard to convince a teen to do anything they don’t agree with, let alone getting them to the myriad of appointments with doctors and clinicians that can help. Occupational therapy plays many roles in helping kids and teens address issues with mental health. While some occupational therapists are trained to provide psychotherapy, others use meaningful and enjoyable tasks to help with mood elevation, reactivation and reengagement. We are skilled at looking beyond the obvious to get a better sense of what might help at home, school or in the community to get your child or teen on track. Sometimes it is as simple as helping them to reorganize their school work, create a process for managing assignments and tests, teaching them how to study in a way that works for them based on their learning style, or even looking at how their week is managed to make changes. Occupational therapists tackle things like sleep / wake schedules, eating and diet, activity participation, grades and school success, managing friends and relationships, motivation through engagement, and dealing with negative pressures that create more stress and anxiety. My advice if you are concerned about your child? Start with your family doctor and discuss your concerns, even if your child won’t attend with you. Involve the school in your concerns to get their support and guidance, after all your child spends several hours a day in their supervision and care. Teachers can be a great resource and form of support as well, but you need to open those lines of communication. Don’t expect the school to come to you – often they don’t. If your child is in crisis, call your local Crisis Outreach and Support Team (COAST) and ask them for help. They can (and should) also connect you and your child to other community programs. If you have coverage for mental health treatment for your teen (extended benefits, other insurance funding, out-of-pocket), including occupational therapy, consider enlisting a private therapist. Private therapy often provides a larger scope of service, is more specialized, and can be provided over a prolonged period if appropriate. Any good private therapist will try to work themselves out of a job by getting your child on track as quickly as possible and they will want you to immediately feel the benefit of their involvement. Also, if you have private dollars or insurance coverage, I would suggest a psycho-educational assessment. These are extremely thorough “brain tests” that look at all aspects of how your child processes information, manages cognitive tasks and addresses the complicated relationship between our brain and our emotions. The outcome of these assessments can be extremely helpful and will provide both you as a family, and the school, with suggestions for how to best help your child to succeed. I have always said watching my kids grow up is the best and worst part of parenting. It is especially heart-wrenching if your child is struggling. Watch for the signs, talk to your child and get them (and you!) support if they need it. Today is Bell Let’s Talk Day in Canada. Again this year Bell will be raising funds to support mental health initiatives across Canada and to help put a stop to the stigma surrounding mental health. 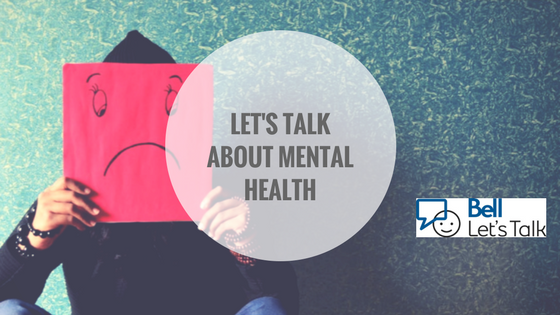 Learn more about mental health and how you can make a difference by visiting The Bell Let’s Talk website. 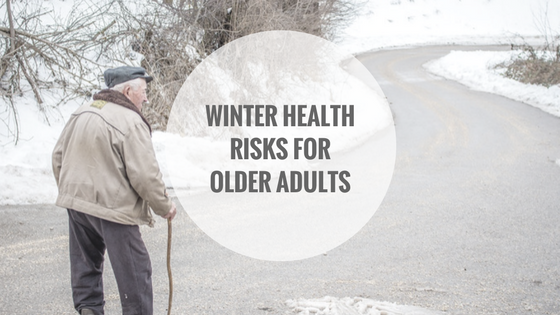 Although winter can be a beautiful time, did you know that the cold temperatures can be hazardous to the health of senior citizens? Learn more about the risks older adults face when the temperatures drop in the following care of Comfort Keepers. I made a comment after the Holidays that I was slowly recovering from Christmas Affective Disorder. For me, Christmas is stressful, hectic and challenging. I struggle with it every year. After the seasonal rush, it takes me days, or even weeks, to get back to my normal equilibrium. However, really, winter despair is not a joke and for some, can be debilitating. 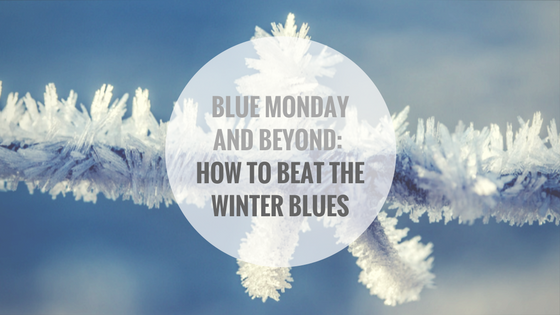 In fact, some research suggests that up to 15% of people in Ontario experience the “winter blues”. These leave you feeling tired, groggy, and maybe even sad or irritable. While this causes discomfort, it is not incapacitating. However, a more serious form of the winter blues, known as Seasonal Affective Disorder (SAD), can be. While occurring less frequently at 2-3% of the population, the symptoms can prevent individuals from leading a normal life. Symptoms of SAD include decreased energy, changes in appetite, especially leading to cravings for starchy or sweet foods, oversleeping and weight gain, among other things. If you feel this is you, talk to your doctor and have your symptoms investigated. 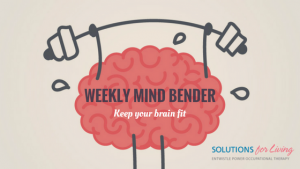 Use behavioral activation to keep your normal routine. Make the bed, have a shower, prepare a decent breakfast, walk to the mail box. Don’t change habits that are ingrained just because it is winter. Never underestimate how damaging it can be if you avoid even small things that ultimately add up to a productive day. Gradually try to get back to those important tasks if you have found that your daily behaviors have become unproductive. Stay active. Those that love the winter do so because they get outdoors. Walk, ski, skate, toboggan – something to help you appreciate how wonderful a change of seasons can be. This is best facilitated by proper clothing that will keep you warm. If exercise is tough for you, build it into your day by default – park farther from the door, use the stairs, make a few trips from the car with the groceries to get the blood flowing. Consider light therapy. Sit by the window at lunch, get some fresh air when the sun is out, or consider purchasing an artificial light for your use at home. Up the nutrients. When some bad eating habits creep into your winter these can be hard to break come spring, and only contribute to further mood declines. Shop in the fruit and veggie isles, and avoid the isles that house the bad foods you seem to be eating too much of. Finding ways to help you do the things you want to, need to, or enjoy, is at the heart of occupational therapy. While the winter months can be long, dark, and cold, ultimately how we adapt to the seasonal change is up to us. If moving or going south is not an option, consider some of the above tips to make the winter bearable, or dare I say, even enjoyable? Kurlansik, SL & Ibay, AD. (2012). Seasonal Affective Disorder. Am Fam Physician. 2012 Dec 1;86(11):1037-1041.